Hawthorn is a leafy and attractive rsuburb just six kilometres east of the Melbourne CBD. 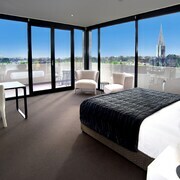 Our Hawthorn accommodation is perfect for a comfortable and elegant stay in Victoria’s capital city. Settled in the 1830s, Hawthorn was supposedly given its name because Charles LaTrobe, the superintendent of the district and later to be Victoria’s first lieutenant-governor, thought that some of the shrubs growing in the area looked like hawthorn bushes he had observed in Britain. The settlement grew quickly after the Hawthorn Bridge was built across the Yarra River and it soon attracted those who had made their fortunes in the gold rushes of the 1850s. Today Hawthorn is ideally situated for easy access to the centre of Melbourne and outlying areas. It has three railway stations: Hawthorn, Glenferrie and Auburn. It is also served by several tram routes. The Hawthorn Town Hall is one of the many fine examples of late 19th century architecture and design that you can see in the area. It is currently being transformed into an Arts and Cultural facility. Hawthorn also has many grand Victorian houses and churches and some of the oldest and most prestigious schools in the country, with their impressive buildings and grounds. You can also visit a number of attractive and shady parks and gardens, some of them with their original 19th century designs still evident. You can enjoy pleasant walks and great views along the Yarra River. If you are out and about in the area, you can shop along Glenferrie Road for just about anything, especially fashion. There are plenty of retail centres, too. Try Auburn and Burwood Roads. Hawthorn is also well known for its restaurants, offering a wide range of international cuisines. You won’t have to go too far for entertainment; the Hawthorn area has a great choice of hotels, bars and nightclubs. The Governor Hotham Hotel, on Burwood Road, is one of Hawthorn’s oldest hotels. It has been in business since 1855. For football fans, Hawthorn is the home of the Hawks team. The Glenferrie Oval Grandstand is also listed in the Victorian Heritage Register. Each Melbourne suburb has its own unique character and Hawthorn is certainly memorable. Book your cheap flight to Melbourne and your Hawthorne hotel now so you can enjoy the charm, convenience and comfort of this great spot not far from the city centre. How Much is a Hotel Room in Hawthorn? Hotels in Hawthorn start at AU$138 per night. Prices and availability subject to change. Additional terms may apply. Good in a pinch ; great if saving money. Good over all location.